Amberd is the name of an ancient fortress in Armenia, which today is considered the best example of the Armenian fortress construction. Although the half-destroyed, castle Amberd is a valuable cultural and historical site of the country in which there remained many other such early medieval buildings. Amberd is one of the best and largest examples of Armenian fortress construction. Armenian name Amberd means "castle in the clouds." So called because of its location at 2300 m altitude on the slopes of the Mount Aragats, when crossing the rivers Arkashen and the Amberd . This is an area in the Armenian province of Aragatsotn. The nearest village to the fortress Amberd is the village of Byurakan, located about 6 km from the historic site. Standing not far from Yerevan, Amberd has a beautiful view of the valley Ararat. Beautiful name of the castle is mistakenly associated with the local medieval Vahramashen Church, which acted in the 11 century near Ambard. The story of these historic ruins can be traced 13-14 centuries back in time. Settlement at this location was from the Stone Age onwards. The foundations of the fortress were laid during the 7 th century when the palace was built and part of the wall too. The property belonged to the trade princes Kamsarakan. After about 4 centuries the castle fell into the possession of the chamber Pahlavuni and was expanded and strengthened by Vahram Vachutian Pahlavuni. In 1026 Vahram built a church dedicated to Surb Astvatsatsin, builds walls of the fortress Amberd and added three bastions along the ridge of the canyon of the river Arkashen. Quite unusual for a military fortress of the Middle Ages , but Amberd until today remained as built in 11 th century with complete bathroom sanitation. In 1070 the fortress was attacked and conquered by the Turks, but in 1197 the joint forces of the Georgians and Armenians succeeded to push back. Commander was Gen. Zakarian, and in 12 and 13 century walls of the fortress Amberd are re-inforced and overall structure has been strengthened and restored. After another change of owner and a brief Mongol conquest castle was left to the arbitrariness of fate and thus to 20 century, when excavations began. 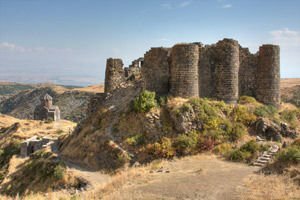 Amberd fortress extends over an area of 1500 square meters and is built of massive basalt blocks. The ruins of the castle are still able to preserve much of its internal structure. The bathrooms in Amberd located at the southern end of the fortress, they are quite well preserved individual premises where water channels can be seen. Interesting to view are secret passageways of the fortress. Among the objects found during archaeological excavations in Amberd are bronze lamps, burners, mortar, pieces of pottery, toilet bottles, baby cups, decorated plates and jugs.